As promised, it’s been awhile since I’ve posted anything on here. Since it’s been so long, I’ll give you two options for this update. A short one and a long one (or you can always take option three and just hit the ‘back’ button on your browser). Life has obviously been a lot different with the kids in the house. (Quick recap – my wife and I adopted a sibling group from the foster system). They moved in around the middle of August, just enough time for us to try to get settled into a routine before school started. Since this blog is public, I’m extremely limited with what I can say and I can’t post any photos showing their faces. That’ll change in about six months when the adoption is finalized. In the interim, we’re tied to the foster care rules. However, I can say that things have gone really well. It’s been an adjustment for all of us, but I feel like we’re all getting used to the new normal. Our house is not without teenage girl drama, and our son wants to do little more than play Minecraft all day, and I’m exhausted beyond belief right now. But it’s good. Very good. My triathlon was scheduled for about four days after the kids arrived. I was surprised that they wanted to get up at 7a on a Sunday morning to come watch me race, but they both did. The race had an indoor pool swim, and after sitting in the bleachers at the pool for 3 hours, they called off the race due to thunderstorms. To say that the race organization was a cluster f*ck would be an understatement. Even when it became obvious (to those of us who looked at the radar on our phones) that the race wasn’t going to happen, they wouldn’t let racers leave the building and pack up their bikes and leave. Why? Because no one was there to make sure that the right person took the right bike out of transition. Take that one to the logical conclusion, and you’ll note that they didn’t have anyone watching over the hundreds of thousands of dollars worth of gear in transition. It was just sitting in a parking lot in the middle of a city, unattended. I’m not signed up for any other races right now. My physical activity level has basically gone down the toilet. Part of it is due to life logistics now, and I’m still working on trying to find a routine that works for me. Probably the larger reason for my inactivity, though, is that I’ve been dealing with depression for quite some time. I started on meds before the kids came, but I realistically should have gotten on them MONTHS before that. 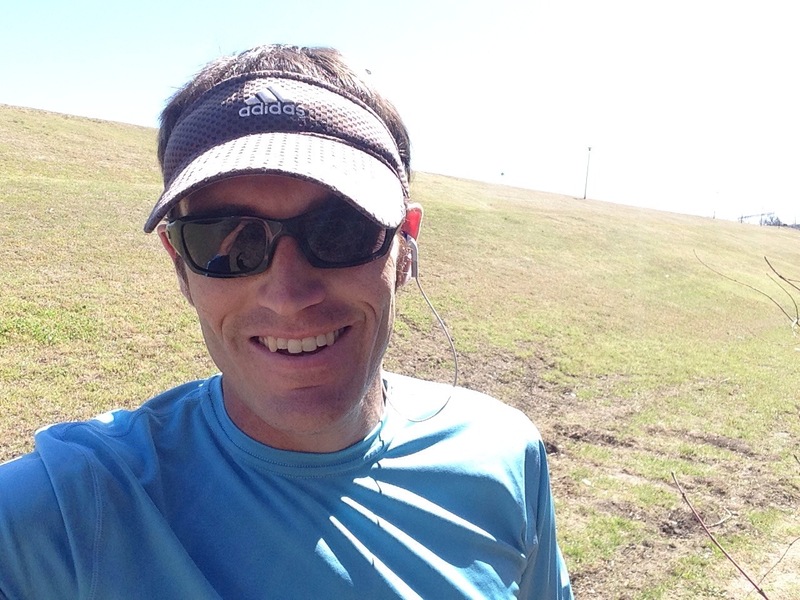 The downhill started around the time of my DNF at Rocky Raccoon, and it just kept getting worse. It’s only been recently that I’ve realized how much that race hurt my psyche. (That DNF didn’t cause my depression, it was just the first in a line of life events, and I had not been taking care of myself to stave off the depression). I really want to get back into better shape. I remember a time when I could walk out the door and crank out a 20 mile run at a sub-8 minute pace with no advance prep. I would just get up, decide I wanted to run 20, and go make it happen. Now, I’d be very hard pressed to crank out 10 at that pace. A lot of days my four mile lunch runs are slower than that. It’s an odd dichotomy in that I really want to get out more, but I also have almost no motivation to do so. I’ve been thinking of joining up with a local tri group, because I think I really need some sort of accountability (right now I have zero). Not sure when I’ll actually make that happen. Maybe I just need to sign up for a race of some sort to give myself some motivation. I’d still like to try for a sub-3 marathon at some point, but there’s no way that’s happening anytime soon with the shape I’m in. Maybe I should train for a 5k at that pace first – that’s probably a better starting point. 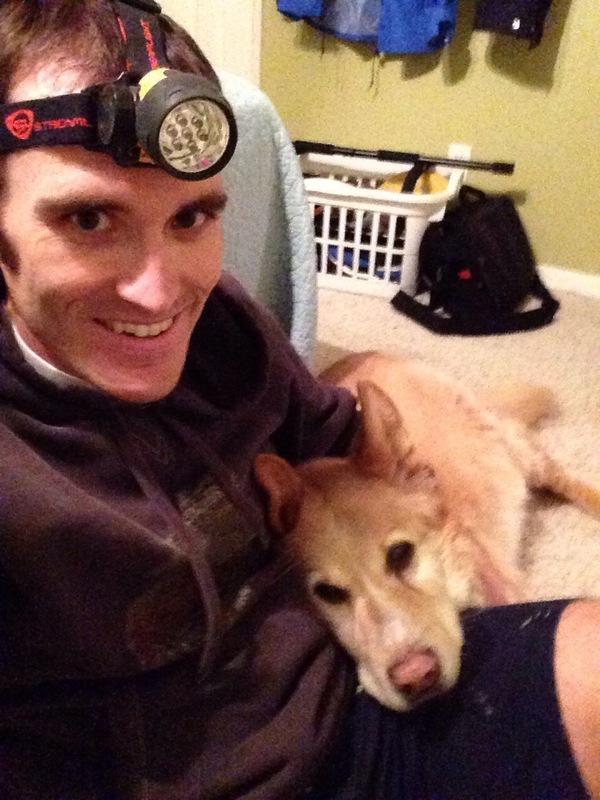 So, I realize that I was said I would write a recap on my triathlon in mid-April. I didn’t end up racing, so there’s no recap to post. The Wednesday before the race, I got a phone call saying that my grandmother had passed away (not entirely unexpectedly), and so I flew up to Canada for her funeral. The local triathlon shop that put on the race was gracious enough to allow me to transfer my registration to another race. So, I’m signed up for the same triathlon that I did last year, which will be mid-August. I will post a recap after that race, but there likely won’t be much on here between now and then. April 1, 2014 6:02 pm / 24 Comments on Shutting Down? My wife and I talk a lot about liking the idea of something, versus actually liking the reality what that idea actually is/entails. Example – I really like the idea of blogging. In reality though, it’s way down on my priority list of things to do. And blogging is about to fall a whole lot lower on the list. In two very short months, I’m going to have a teenage daughter and a ten year old son. Yup, we’ve been “selected” for this adoption! I haven’t really been spending much time on this blog lately anyway. Nor have I been spending much time training, which was the original impetus for this blog in the first place. I have a triathlon in two weeks (my second ever), and I finally put on a pair of swimming goggles last night for the first time in seven months. That swim lasted five whole minutes. Luckily it’s going to be a wetsuit swim, so at least I shouldn’t drown. Assuming I can get my wetsuit on, that is. The wetsuit was tight when I bought it – tack on some extra “winter” weight, and I thought I broke the zipper when I had my wife help me try to stuff myself into it last night. Anyway, so I’ll probably blog a recap from that race, but there’s a chance that will be the last post on here. I don’t know everything that comes along with fatherhood, but I’m pretty sure that it won’t come with a supply of extra hours in each day. So, it’s been a while since I actually sat down and blogged – basically since my Rocky Raccoon recap over a month ago. I would apologize, but you get what you pay for around here. Besides, if you’ve been hanging on pins and needles to find out what’s been going on in my life, you probably should be questioning your life. Anyways, so here’s a very random recap of what’s been going on. No rhyme or rhythm, but I did include pictures – that has to count for something, right? I’ve got a sprint tri coming up in five weeks. Yikes. I really need to start swimming! More importantly, I need to drop a few pounds. I’m going to need my wetsuit for this race, and there is currently zero chance that I’d be able to zip that baby up around me right now. If I drop seven pounds, I think I’ll make it in. So there’s my goal. Seven pounds in five weeks. 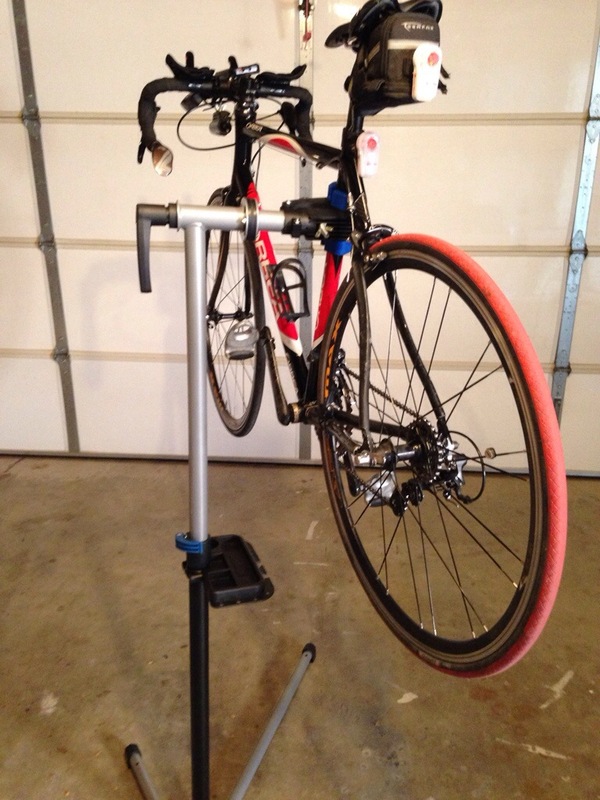 I had a birthday, and my wife got me an awesome bike work stand (among other great gifts). This poor little Monkey started peeing blood, and so we had to rush her to the Emergency Vet. That cleared up, and the she ended up with a bad skin issue that we’re in the middle of dealing with. Been a rough month for Monkey. 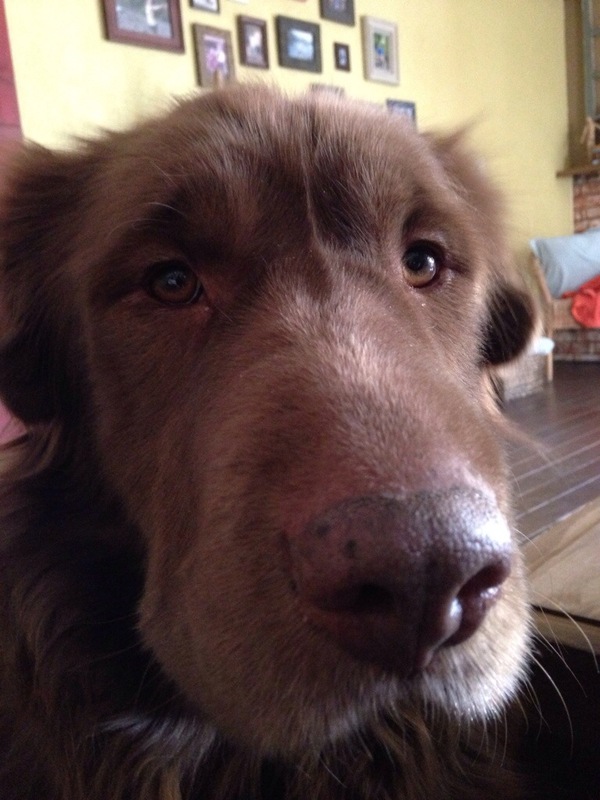 This guy, on the other hand, has been incredibly helpful as I work on projects around the house. That is, if “helpful” meant pawing at me for attention. Speaking of house projects, I feel like that’s all I’ve been doing lately. But they count as cross-training, right? 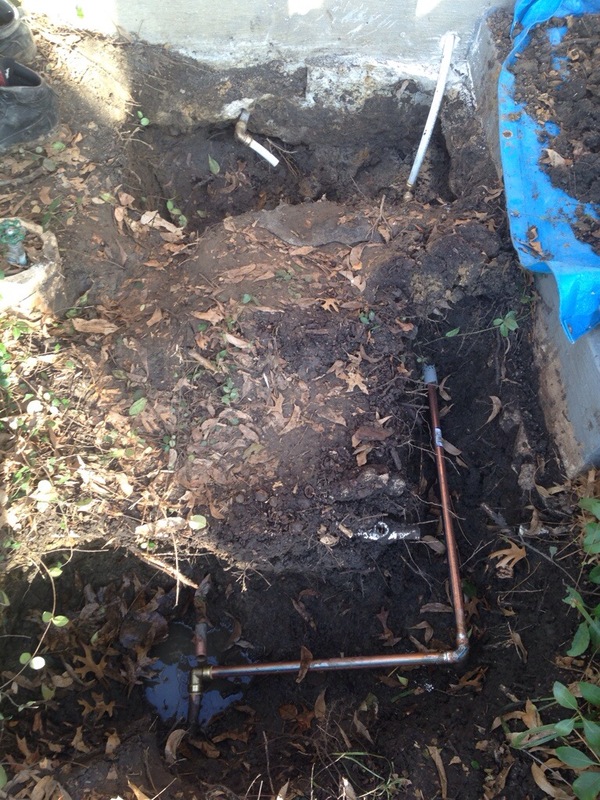 We had a leak in the main water line that feeds our house, which lead to a weekend of plumbing for me (I like most house projects, but plumbing is never something I’ve enjoyed). I called some plumbers out to find and fix the leak, but they got real shady on me so I told them to leave. Glad I did since they were wrong about where the leak was. So I ended up digging up part of our front yard and running a new water line through the attic. I only had to cut holes in the drywall in three rooms to run the new line. Routing a new section of pipe outside. 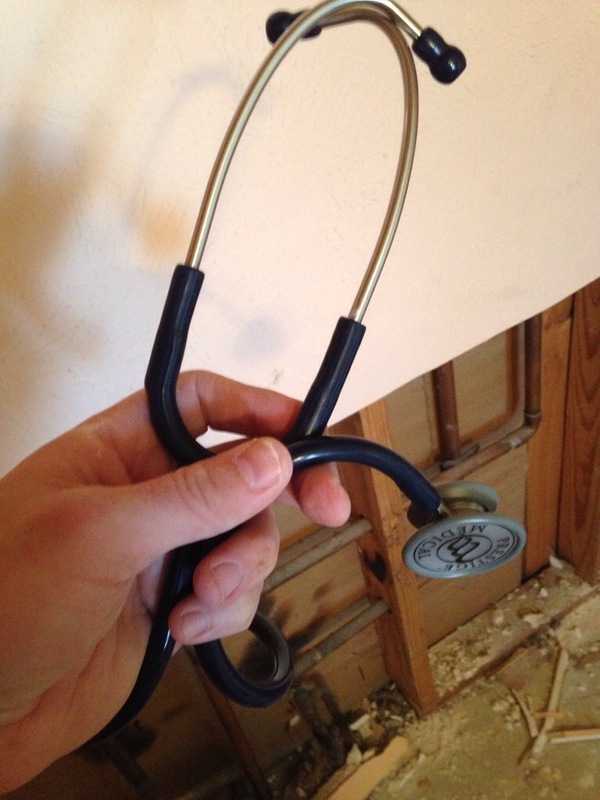 Had to use a stethoscope to find the pipes in the walls. I didn’t want to make more holes than necessary! Playing in the attic. 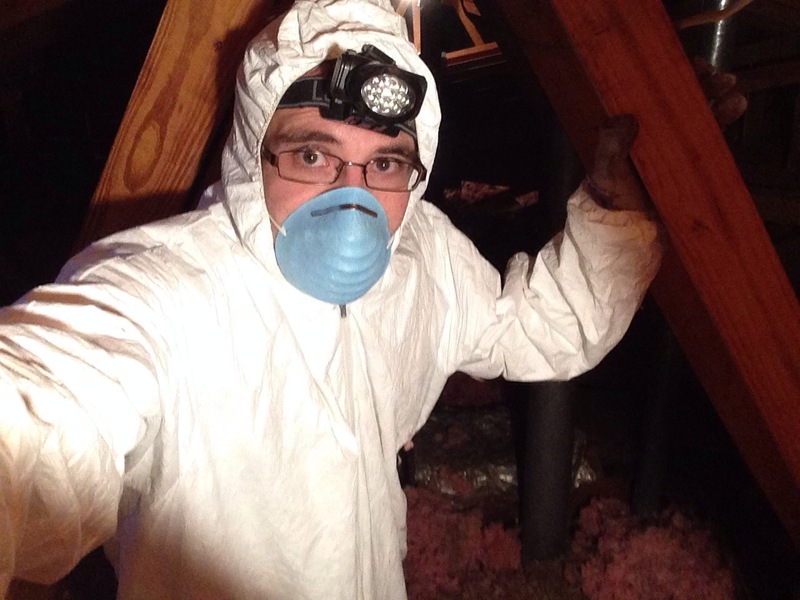 Yes, I put on a full Tyvek suit – fiberglass insulation is itchy! 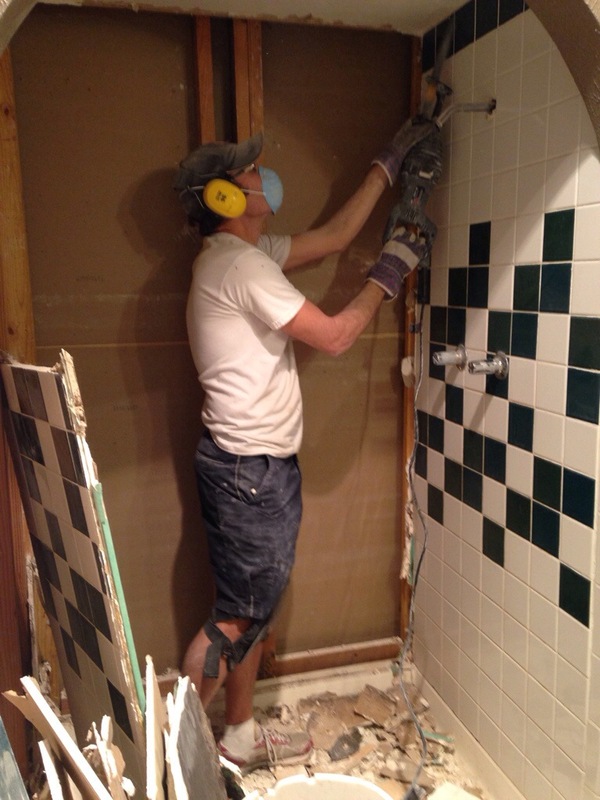 And then there is our bathroom remodel, which hasn’t exactly been going as planned. Removing the nasty old tiles went pretty well once I realized I could use my reciprocating saw to cut through the grout and remove the tiles in large sections. Mental note for next time: If the fiberglass shower unit you get will fit through the narrowest doorway by spinning it around, that doesn’t mean that you will be able to flip it into the right position once inside the bathroom. 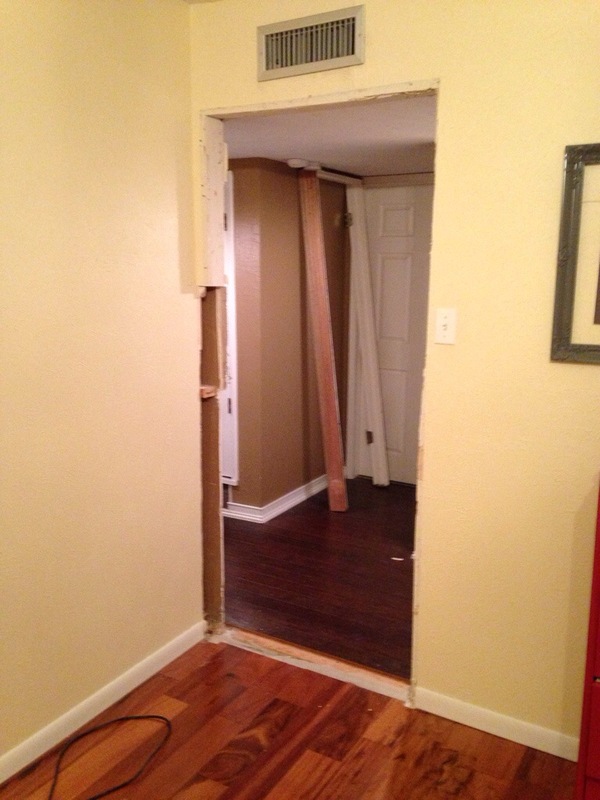 You may end up need to: 1) remove the door from the hinges, 2) remove the entire door frame because it still doesn’t fit, and then 3) knocking out one of the studs and some drywall to get the shower through the doorway in the correct position. And then you may have to do the same thing for your bedroom door, knocking out a stud since you are 1/4″ shy of fitting through the doorway without removing drywall. The bathroom is still a work in progress. I’ve made more trips to Home Depot in the last two weeks than any person should have to make in a lifetime. Seriously, I think I’ll count up my credit card receipts sometime. I must be somewhere around 24 trips. Once it’s all finished, I may post a before and after. 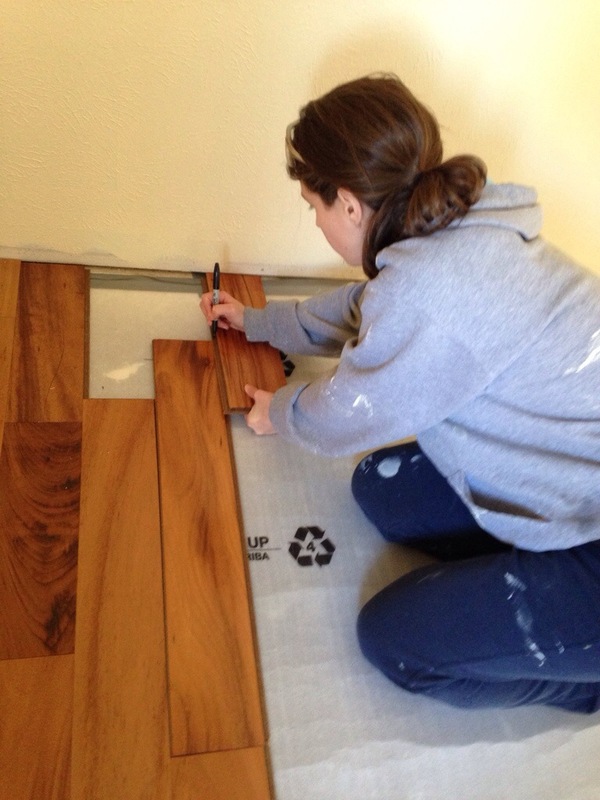 But the one project that did go “as planned” around here was the new wood floors in our bedroom. The bedrooms are the only rooms with carpet in them, but having three big dogs isn’t very conducive to carpet anywhere. So, we decided to spend the rest of our tax refund on some new flooring for our bedroom. My wife and I have laid hardwood floors together at least three times. And by hardwood floors, I mean the true hardwood floors that need to be nailed down to the subfloor. When we moved in two years ago, we put down hand-scraped bamboo in most of the main living areas. This round, we went with “engineered hardwoods” that click together. Holy sh*t, what a difference! I helped Natasha with the first two rows, and then went into the bathroom to work. Before I knew it, she had pretty much finished the entire bedroom by herself. Hands down the best looking person on the construction crew. It looks a lot better in there now, and I feel cleaner without the carpet. 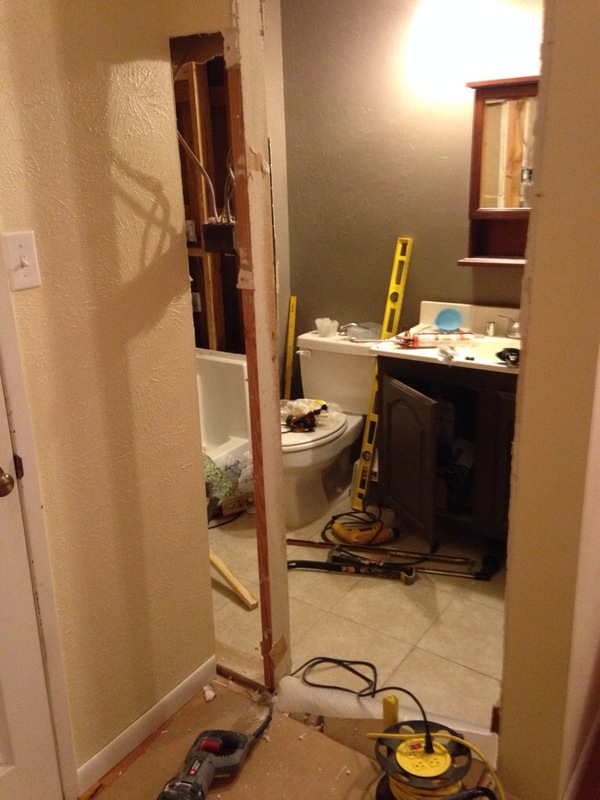 Hopefully this coming weekend I can finish up our bathroom, and then we can stop living in a construction zone. I’m getting tired of tripping over my tools every time I turn around! 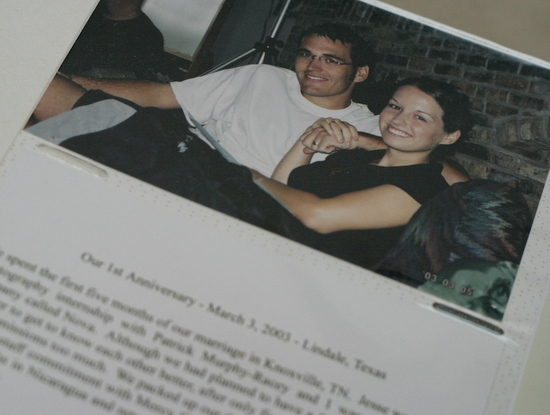 Twelve years ago, I married the love of my life. We were both very young, but we were in love. Natasha had the wonderful idea of taking a photo every year on our anniversary, and writing a little something about what we did the past year. Our album is slowly growing, but there are still plenty of empty pages yet to be filled. 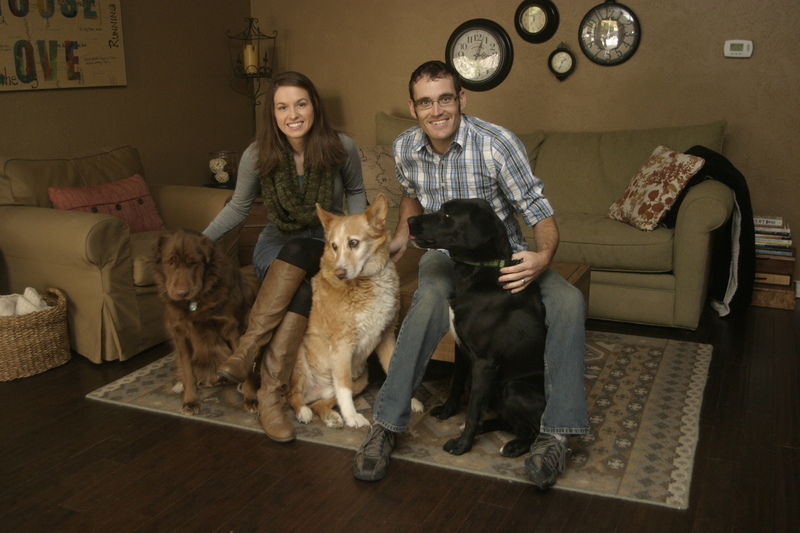 Today, we will once again set up the tripod in the living room, and snap another family photo (ok, so it usually takes us about 20 tries to get the dogs in the photo). Then we’ll sit down, and write a little bit about what we’ve done the past year. It’s always funny for me to look back and see how much we’ve changed (and changed our minds!) over the years. But, we’ve always changed together, and that’s the most important thing. I’m looking forward to many, many more anniversary photos with the most wonderful, supportive, intelligent, and beautiful woman in the world.